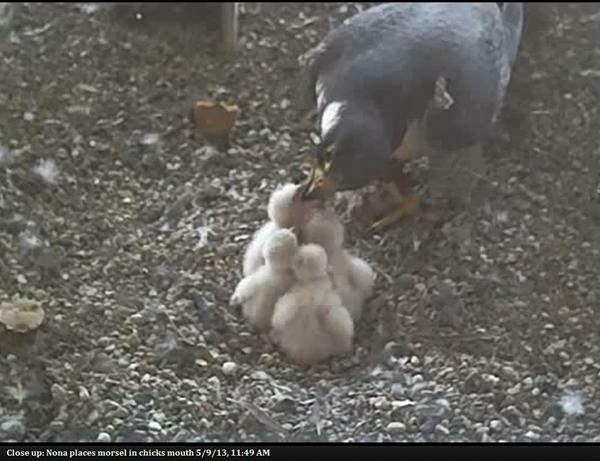 Nona, the mother of four peregrine falcons who recently hatched on Evanston Public Library, feeds her young. The library will host a banding ceremony May 30, when identification rings will be attached to the chicks. Do not be surprised if you see falcons swooping over downtown Evanston in the next few weeks. Workers from The Field Museum and Shedd Aquarium will come May 30 to the Evanston Public Library to band four recently hatched peregrine falcons. The feared birds known for stunning their prey in 200-mph sky dives have chosen to make the roof eaves of the Evanston Public Library their nesting spot again this year. The library will invite residents to watch the chicks banded, named and sampled for blood during the ceremony. The Field Museum has monitored peregrine falcon populations since the 1960s, when the chemical DDT had killed off much of the species. Although the peregrine falcon population has since recovered, the urban sprawl of the Chicago metropolis remains a hazardous habitat for the birds, especially fledglings, local birdwatcher Deborah Cohen said. But all of this year’s batch of peregrine falcon chicks have hatched. Out of last year’s batch of four peregrine falcon eggs, only two ended up hatching. The mother of the four peregrine fledglings is called Nona, for “no name,” and the father is called Squawker, Cohen said. She noted that she learned an Evanston falcon nesting at the University of Wisconsin-Madison was named after her in 2009.